Humble self in the Missouri State Capital in the Governor's office with the portrait depicting Sam Clemens in the pilot house of the MARK TWAIN, a St. Louis harbor boat that was renamed for him in time for his last visit to the Mississippi River in 1902. I have to confirm the artist's name, I think it was Gari Melcher but we'll have to confirm that (we have a photo of the painting elsewhere in my wing of the museum and the painter's name is in the caption). I am working from a substitute computer while my main one is in the shop and I'm not set up to browse your museum without losing this message. Photos of Dan Martin on the left (Weatherbird and Postcards from Mound City Cartoonist for the St. Louis Post-Dispatch) and Dave Thomson on the right, taken in September 1991 in the pilot house of the LONE STAR at LeClaire, IOWA. 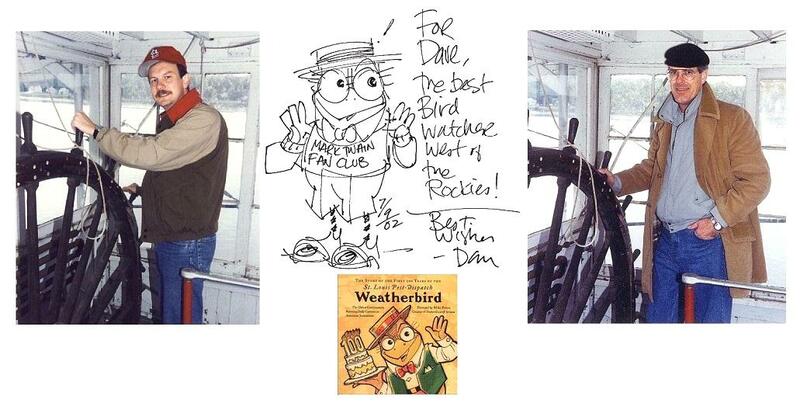 Included at center is the cover of Dan's Weatherbird book and a drawing he made in Dave's copy of the book. 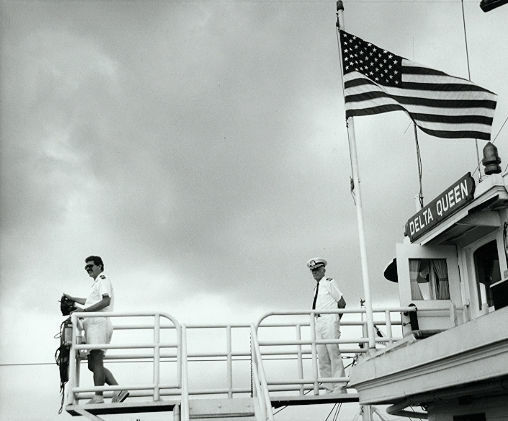 "We had just completed a round trip from Le Claire to Galena, Illinois aboard the JULIA BELLE SWAIN and toured the old STAR together when we got back to LeClaire. Thankfully the LONE STAR is now under protective housing on the same site where she's shielded from the elements. I haven't had a chance to visit the STAR in her new accommodations but they look excellent from the few photos I have seen." The Story of the First 100 Years of the St. Louis Post-Dispatch Weatherbird: The Oldest Continuously Running Daily Cartoon in American Journalism, by Dan Martin Amazon.com. 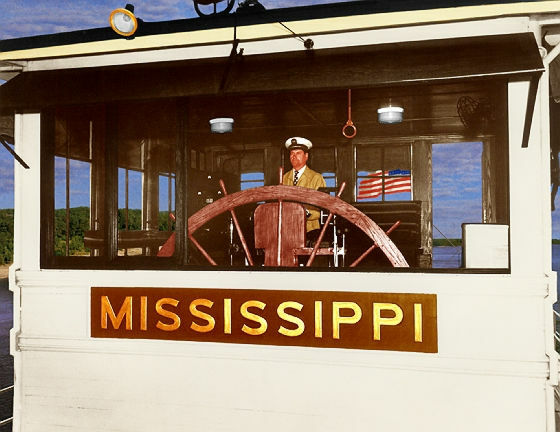 Dave Thomson's colorized photograph of Captain David M. Cook on the third Corps of Engineers boat called the MISSISSIPPI. 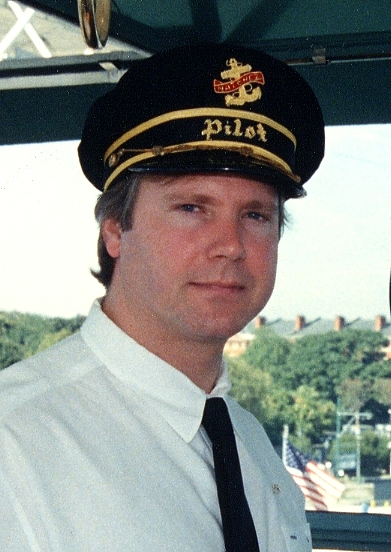 Verne Streckfus 1989 pilot house of Natchez at New Orleans (above). 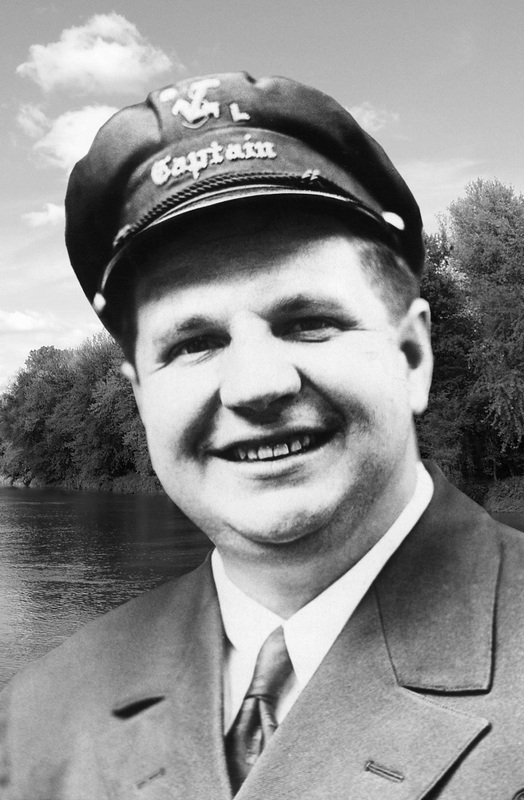 Captain Hillman's book: One Man and the Mighty Mississippi (click to see it at Amazon.com). 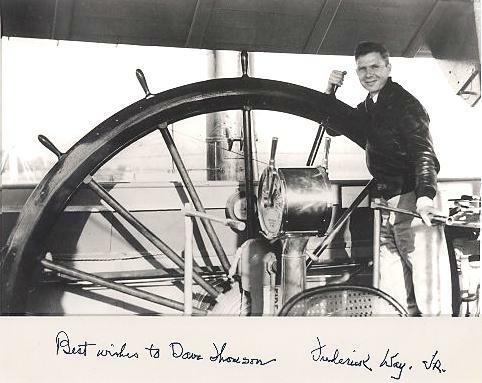 Captain Tom Greene of the Steamer Tom Greene who hopes to defeat the Steamer Betsy Ann in a race on the Ohio River from the Cincinnati, Ohio wharfboat to the new Richmond dam which is 25 miles away on July 16th, 1929. Tom was photographed in front of a distracting brick wall which I replaced with a detail from a riverscape I took north of Hannibal, MOin 2005 of Ziegler Chute, a backwater of the Mississippi River which flows between the Missouri shore and Ziegler Island.